As a huge fan of Saveur magazine I was thrilled to see they ran a piece on making your own bacon at home a few years ago. Of course I have my own recipe I enjoy so I forgot about the article until last month when I was perusing Saveur’s web site and came across the recipe online. Since I like to work with five pound pork bellies and want pink salt in my cure I modified the recipe as follows. It turned out well but I found the bacon very savory: it worked beautifully in all my recipes as lardons but didn’t taste right for breakfast with eggs and toast. Breakfast requires my sweet bacon recipe. 1. Combine peppercorns, fennel seed and caraway seed in a spice grinder and coarsely grind. Combine with the rest of the cure ingredients. 2. Put the pork belly in a gallon zip top bag and dump half the cure on the belly, turn the bag over and dump in the other half. Seal the bag and give it a good rubdown, getting the cure evenly spread. 3. Put the bag in the fridge for about seven days, turning it over every other day. There will be liquid in the bag after a day or two and that’s just fine. If the belly isn’t firm when pressed after seven days give it another two days. You want it to feel firm as the moisture should have been drawn out and the cure drawn in. 4. Give the belly a good brushing off under running water: you want the excess cure off but leave any stuck herbs or peppercorns. Dry it off and put in the fridge uncovered for a full day. 5. 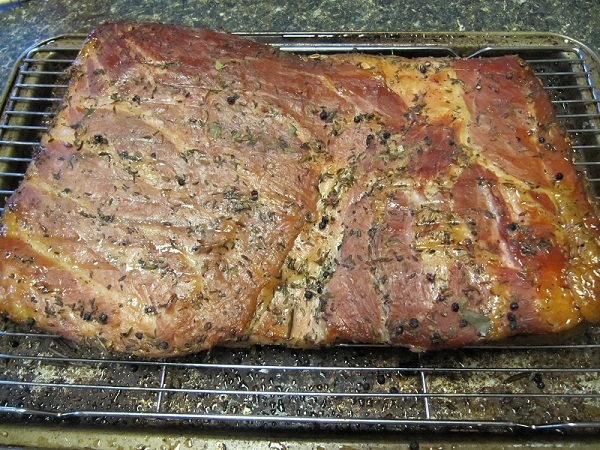 Smoke the belly at 200 degrees until it’s internal temperature reaches 150 degrees. Alternatively you can put the belly on a baking sheet and put into a 200 degree oven until the belly’s internal temperature reaches 150 degrees. 6. 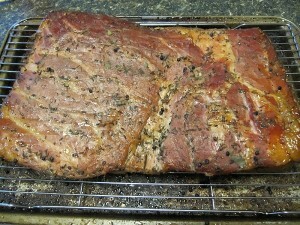 Put the belly skin side up on a cutting board and make a small cut at one corner just under the skin. Using a pair of tongs get a good grip on that corner and start pulling the skin off: when the belly is hot the fat will give way to your removing the skin. This has to be done right away or you’ll end up having to cut the skin off with a long carving knife and that’s just a pain. 7. Wrap it up and refrigerate: you now have homemade bacon that will keep for about a month.